A recent discussion at webmasterworld shows that there have been some businesses that have been impacted already. We have blogged before about Panda related problems, but what got us interested this morning was that the quality of search results appears to have fallen again. The content farms have been pushed down the page, but there are still three of the top 10 results for .edu websites that are promoting their classes. 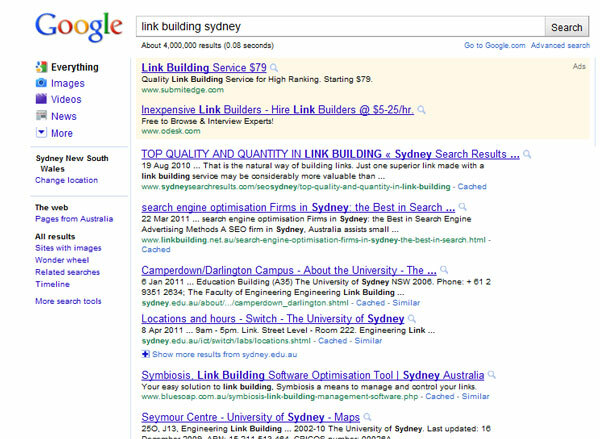 This must be because they are well optimised for the words “building”and “sydney”. I’m just speaking personally, but I’m on the side of most of the folks here. A senior engineer is looking into the [“society of spectacles”] search now, for example.What would be most helpful would be constructive examples of bad queries, bad experiences, or concrete proposals for how to improve Google’s results page or results UI. A list of results from the forum show that we are not the only ones that think the results are poor quality. In a lot of cases, it is not just poor quality, but actually no longer relevant. Have you seen any low quality search results? Post them in our comments!